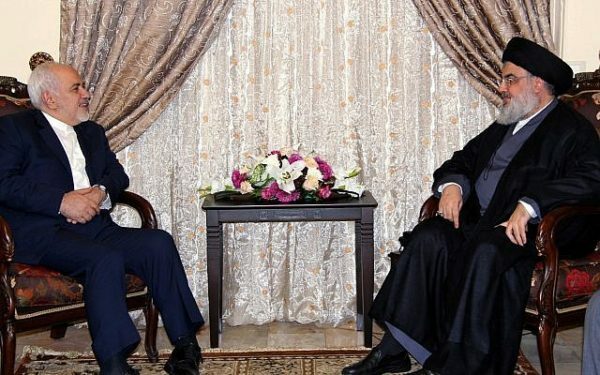 As in the past visits Iranian Foreign Minister Mohammad Javad Zarif ended his visit to Lebanon by holding talks Monday with Hezbollah chief Hassan Nasrallah at an undisclosed location. The meeting was held in the presence of Iranian Ambassador to Lebanon Mohammad-Jalal Firouznia and the delegation accompanying Zarif. “Sayyed Nasrallah thanked the Islamic Republic of Iran and its officials and people for what it has offered to Lebanon, Palestine and the region’s resistance movements and peoples in the confrontation against Zionist aggression and takfiri terrorism,” Hezbollah’s mouthpiece al-Manar TV said. Nasrallah said last week he was ready to secure air defense systems for the Lebanese army from Iran to confront Israeli warplanes ,while noting that Tehran can “easily” solve Lebanon’s chronic electricity problem. “Will the Lebanese government dare to accept the Iranian proposals? Why should Lebanon remain afraid to cooperate with Iran?” Nasrallah said in a televised address marking the 40th anniversary of Iran’s Islamic revolution. Nasrallah also noted that Iran can make a “huge transformation” in Lebanon’s pharmaceutical industry that would “help us slash the medical bill of the state and citizens. Zarif, who arrived in Beirut Sunday, also met earlier with Lebanese president Michel Aoun, Speaker Nabih Berri , Foreign Minister Gebran Bassil and Prime Minister Saad Hariri according to NNA. Hariri questioned questioned Zarif about the fate of Nizar Zakka, a Lebanese citizen detained in Iran. Zakka, a Lebanese businessman and information technology expert who holds US permanent residence, was snatched in September 2015 by Iranian authorities on his way to the airport. He was sentenced to ten years in prison for spying for the United States.Ironically, Zakka had made the trip to Tehran on an invitation from Shahindokht Molaverdi, Iran’s vice-president for women and family affairs, to be a keynote speaker at a conference on women’s entrepreneurship.